A few weeks back, Nasa's Messenger spacecraft ran out of fuel. Since then, the first and only probe we have orbiting Mercury has been on a doomed spiral towards an inevitable crash landing on the surface of the planet closest to the Sun. 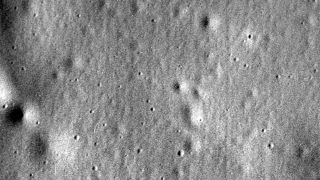 On April 30, at 7.26pm UTC, Messenger hit the ground at 3.91 kilometres per second - leaving a crater about 16 metres wide. Just beforehand, however, it snapped one final photo and sent it home. You can see it above. It shows Mercury's scorched surface - the proximity of the Sun means that planet heats to 420C during the day but its weak atmosphere means it then drops to -170C at night. Those nights last a long time however - the planet's slow rotation speed means one day lasts about two Earth years. Messenger orbited the planet 4,000 times over the course of its twice-extended mission. As the first orbiter we've ever sent to the Mercury, it beamed back fascinating information on the solar system's smallest planet. It spotted ancient lava flows, showed us the presence of ice in polar craters, and presented an atmosphere rich in volatile elements that we didn't expect to find on such a hot planet. We're still trying to work out how they're there. That mission is now over, and in spectacular fashion. But we won't get to see the site of the crash until Messenger's successor, a European-Japanese collaboration called BepiColombo, arrives at the planet in 2024. Until then, in an appropriately ironic ending, what remains of the craft will lie in one of the craters that it spent its whole life studying.